Oh, to rewind time and ask Emery Leonard out to dinner. Then, I might understand his basis for his habitual naming of minor variants. I might also ask him about the origins of his awesome first name. In any case, I digress. Ruellia tubiflora (var. tubiflora, if I must) is a small tree that produces lovely white flowers with a purple splotch in the throat. It was described a very long time ago by Kunth (1818) and grows happily in lowland to mid montane forests of northern South America – primarily Colombia. 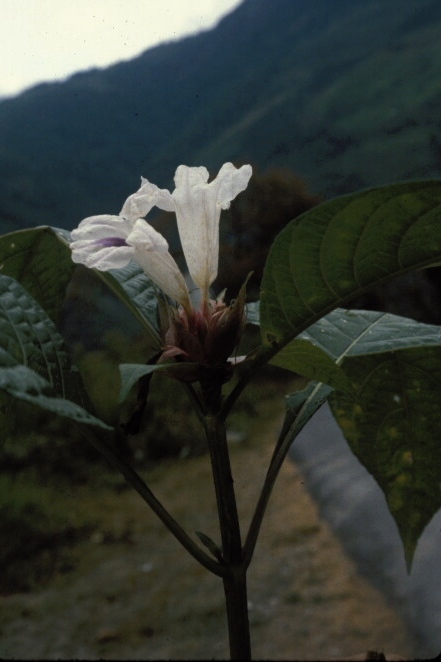 Some number of years later, a variant that produces pure white flowers was discovered and named by Leonard as Ruellia tubiflora var. tetrastichantha (a mouthful). This variety grows abundantly in similar habitats and in southern Centeral American and northern South America – primarily Venezuela. Along with variety tetrastichantha, Leonard proceeded to names six other infraspecific taxa… most of which are not in current use. Here is a photo that long predates my existence in botany. It’s actually the first picture of any Ruellia that I ever laid eyes on…. pretty enough to convince me that the genus warranted further thought. Ruellia tubiflora is a highly charismatic species that is member to a clade that leaves behind conspicuous, congested, cone-like scars after flowers (and their pedicels) that have fallen. See Tripp 2007, Systematic Botany. Plants in this clade tend to prefer high quality, tropical habitats that stay on the wet side throughout the year. Thanks to Lucinda for sharing this with me as a young intern, way way back in 2002. I have since seen and photographed this beautiful plant numerous times in the wild, but I still prefer the above photo, which so altered the course of my life.